I bought this at Home Depot for $10. Its a little better quality Chinese flashlight with a Decent 1Watt LED LED (Cree XP-D) and a nice deep reflector. 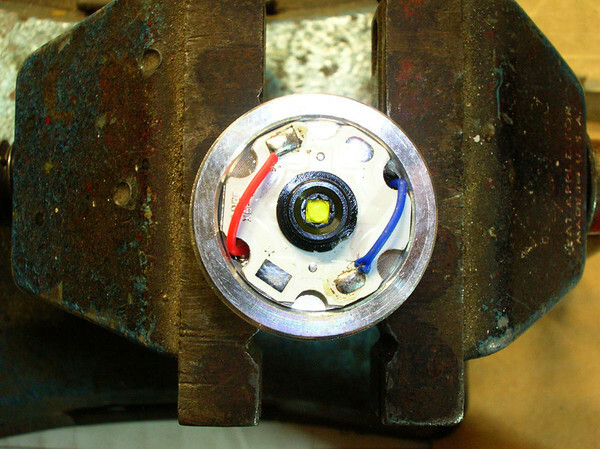 This is a detail shot of the white LED module that is included with the flashlight. It simply unscrews from the flashlight body. The inside of the module is empty. It could easily house a small driver circuit for a more advanced flashlight. Also note the existing pads for a surface mount resistor. This image shows the new 300mW red LED and the 1/2 watt surface mount resistor. Use Ohms law to determine the resistance of the resistor (V-Vled=I * R) This one is being driven conservatively at 90ma. 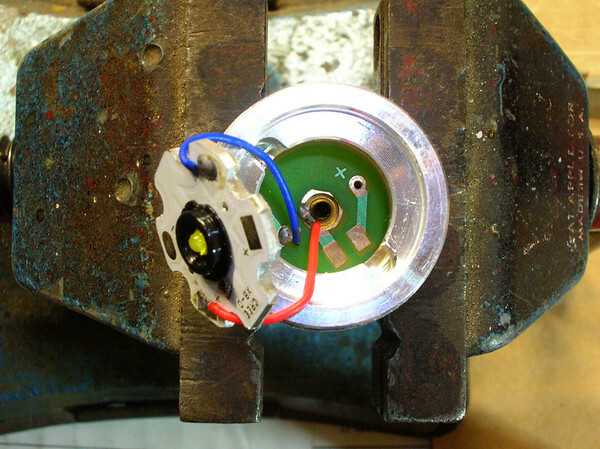 Depending on the LED, it is possible to use a 7135 regulator (350mA). 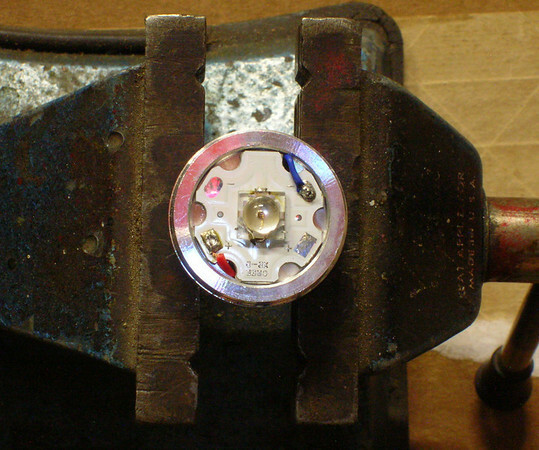 There are also many regulator circuits that may fit inside this package. Although I replaced the LED on the Star, these stars are readily available on ebay or anyplace where LED or flashlight parts are sold. Just be sure to get the right size star, for the flashlight. This flashlight uses a 20mm LED star. 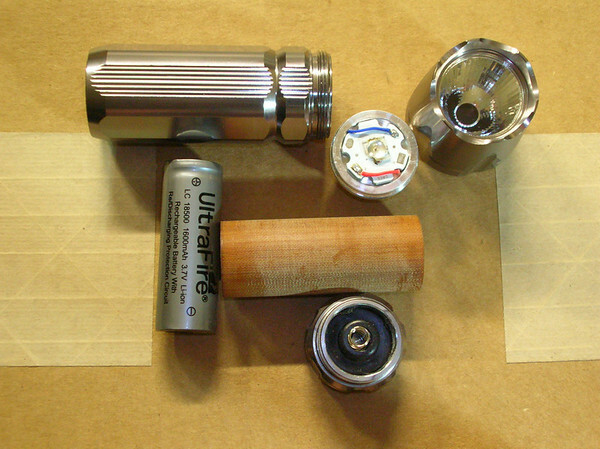 On my flashlight that use 3-AAA batteries, I usually modify them to use an 18500 Li-ion battery. 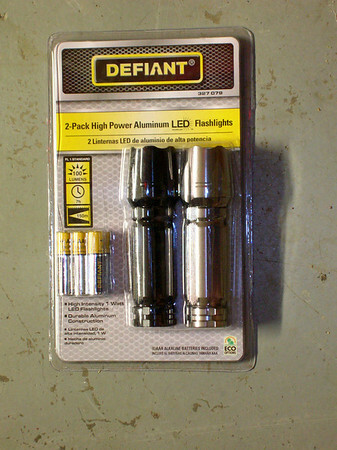 These are a nominal 3.7V, have high capacity and are rechargeable. Be sure to use the Protected Li-ion's with the little PCB on the negative side. This is to prevent over -charge and over-discharge. Alkaline AAA batteries have a typical capacity of 1000-1200 maH. But a 18500 has up to 1500maH capacity. 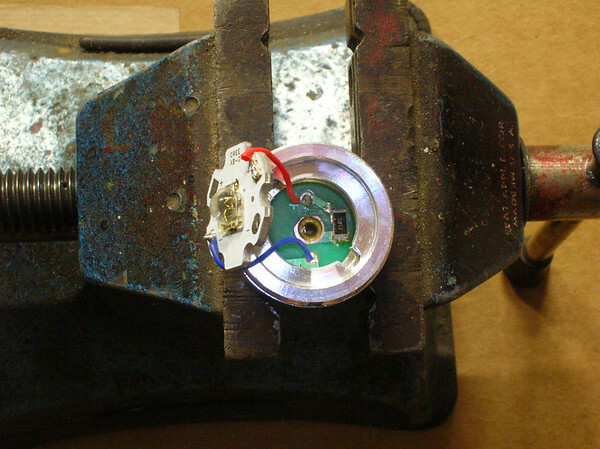 In order to perform this battery modification, a sleeve must be installed. I machine my sleeves, but paper or cardboard would serve the same function. 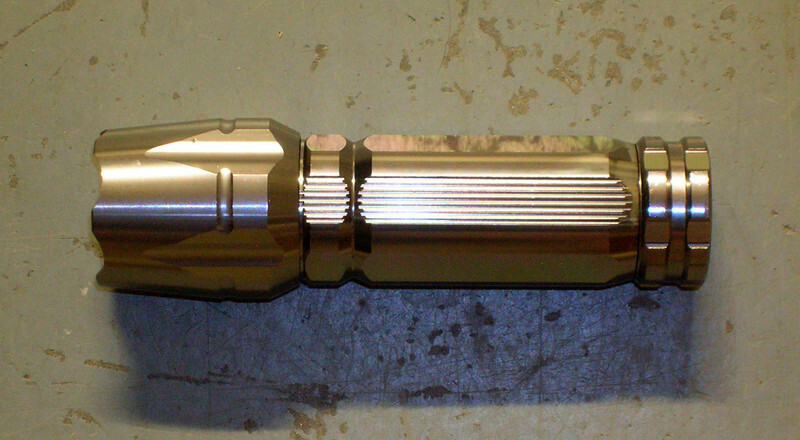 Not a bad looking flashlight. The anodizing and color are nice. The white light performance is good (~100Lm), but modified for an Astro application, it can be modified to what ever size LED the user wishes to install. Keep in mind that the brighter the LED, the shorter the battery life. 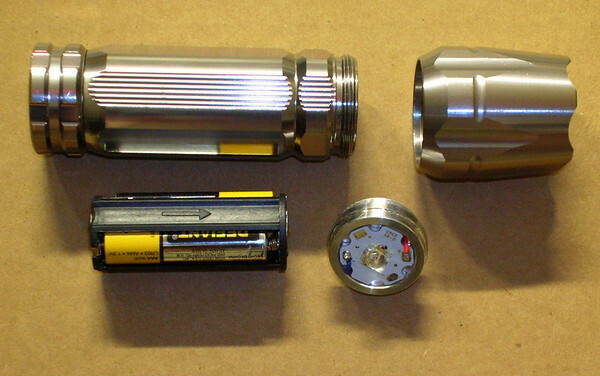 This photo shows the flashlight dissembled. The tail cap also unscrews.